As the seasons settle into their new rhythm there are the occasional days where we feel the winter chill creep back into spring. On these cooler days I pull long socks over my tights and wear a long sleeve knitted shirt dress. Byron and I spend most of our time in our kitchen, which is open plan to join our downstairs dining and living areas. I scrub and peel, chop and dice as he heats swirling oil and sautés the onion as it bubbles and hisses in a heavy bottom pan on the stove. We haven't always cooked well together, to be honest I used to feel a little anxious when we shared a bench top, with playful digs at each other such as, 'You're in my section' as if we were in a busy restaurant. With time and a patience, we gradually fell into our own rhythm together, much like Catherine Zeta-Jones and Aaron Eckhart in the romantic comedy-drama you may have seen No Reservations, a remake of the German film that you may not have seen, Mostly Martha (both beautiful films to watch when it's raining). Heat a generous amount (1 to 2 tablespoons) of olive oil in a large heavy based pot over medium heat. Sauté the onion, leek and garlic for 5 minutes or until the onion and leek softens. Season with salt and pepper. Reduce the white wine over medium heat to cook off the alcohol. Pour the reduced wine, stock, water into the large pot and stir to combine. Add the bay leaves and smoked ham hock, cover the pot and bring to a low simmer. Cook for about 45 minutes, stirring occasionally. Add the chunky potato pieces and frozen peas (fresh peas are perfect if you have them), stir and cook for a further 15 minutes or until the ham hock and vegetables are tender and the peas are soft. When the soup is ready, remove the ham hock to a large plate, allow to cool slightly at room temperature, then pull the skin and meat from the bone and shred into bite-size pieces. Discard the bone, skin and any excess fat (don't worry if there are little pieces remaining, it enhances the flavour and texture). Return the meat to the soup, stir and taste. Season as required, or add additional water or stock to thin the liquid. Remove the bay leaves, then divide the soup, ham hock and vegetables between 4 bowls and serve with fresh, crusty hot bread to dunk into your hot soup. Serve immediately, kiss your husband sous chef passionately and enjoy the salty, smoked flavours of this delicious hearty soup. 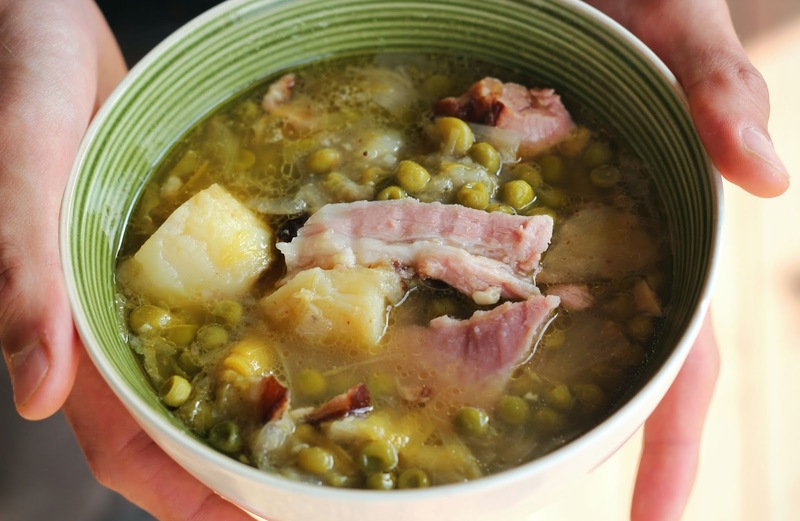 Have you ever combined two of your favourite soups before (pea and ham vs potato and leek)? Sometimes the flavour gamble pays off! Thank you Elaina. On cooler days, eating soup is exactly what we do. Sometimes, if i'm organised I will slow cook it in advance, oh the flavours! I hope you are all happy and healthy.